Samnite Heavy Infantry are well armored with bronze breastplates, greaves and a round argive shield. They are trained to a high degree and carry heavy javelins and the Greek Kopis. Historically, the Samnites were one of the most rebellious Italian peoples and joined up with Rome’s enemies on a regular basis. They fought with Pyrrhos in the 290’s, rose up in rebellion during the first Punic War, and fought alongside Hannibal in the second Punic War. They rose a final time during the Italian Social Wars, and were incorporated into the Roman state by receiving Roman citizenship. 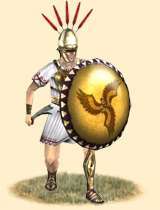 They still fought with their distinctive bronze belts until the middle empire, and even then legions from Samnium still had the national symbol of their former country on their shields.